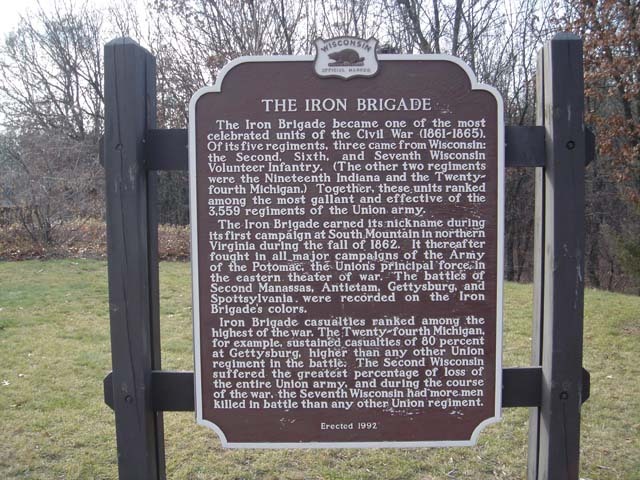 The Iron Brigade earned its nickname during its first campaign at South Mountian in northern Virginia during the fall of 1862.. It thereafter fought in, all major campaigns of the. Army of the Potomac, the Union's principal force in the eastern. theater of war. The battles Of Second Manassas, Antietam, Gettysburg, -and Spottsylvania. were recorded on the Iron Brigades colors. Iron Brigade casualties ranked among the highest of the war. The Twenty-fourth Michigan, for example, sustained casualties of 80 percent at Gettysburg, higher thin, any other Union regiment in the battle:- The Second Wisconsin suffered the greatest: percentage of loss of the entire Union army, and during the course of the war, the Seventh Wisconsin had more men killed in battle than any other jJnion regiment.